Native Son Writes Guide to "Vermonners"
Of the many reference books on the Green Mountain State, few have been written by natives. But now comes Leon Thompson’s Not Too Awful Bad: A Storyteller’s Guide to Vermont. Thompson is a true Vermonter — pronounced “Vermonner,” not “Vermontah,” for you clueless outsiders — who grew up in Swanton (“Swah’in”) and lives in St. Albans (“Snobbins”). He’s also a reporter and humor columnist at the St. Albans Messenger and occasional contributor to Seven Days. That “humor” part explains this book’s breezy, standup tone. In fact, Thompson’s book might have been better subtitled A Jokester’s Guide to Vermont. But he had no say in that part: The volume is the third in a series of insider-culture handbooks published by Islandport Press in Maine. Thompson was offered the writing gig after his friend Rebecca Rule, author of the series’ second tome, Live Free and Eat Pie: A Storyteller’s Guide to New Hampshire, floated his name for the project. You can catch Thompson’s local humor at a reading, where he’s as likely to be promoting the guide as his other two books, collections of his humor columns called Good Junk and Dork: Another Look at My Junk. And, he hints, he may soon grace area comedy stages. “This has been my dream since I was 8 years old,” Thompson declares, and adds that he’s compiling material that includes possibly true short stories set in Franklin County. “I’m thinking the hook is someone who works in their pajamas,” he confides. Will he wear pj’s for his act? Of course. Is he wearing them now? Ditto. 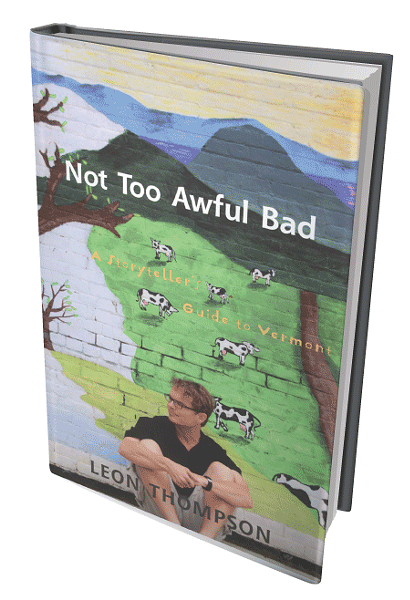 Leon Thompson will discuss the finer points of being a Vermonner and other issues in Not Too Awful Bad at the Lyndon State College Library on Wednesday, March 31, at noon; and at the Boxcar & Caboose Bookshop in St. Johnsbury on Thursday, April 1, at 6 p.m.
Not Too Awful Bad: A Storyteller’s Guide to Vermont by Leon Thompson. Islandport Press, 159 pages. $15.95.